The online version of this article ( https://doi.org/10.1186/s13024-019-0313-9) contains supplementary material, which is available to authorized users. Amyotrophic lateral sclerosis (ALS) is the most common adult motoneuron disease that causes a progressive paralysis due to the selective loss of motoneurons in the motor cortex, brainstem motor nucleus, and spinal cord . In recent years, a growing number of genetic loci have been associated with ALS and other complex diseases (reviewed in [2, 3]). The first mutations identified as a cause of familial ALS (fALS) mapped to SOD1 (superoxide dismutase 1), whereas mutations in the TARDBP gene, coding for Tar DNA binding protein 43 (TDP43), one of the most common components of protein aggregates in ALS cases, were identified years later . Since then, the number of genes associated with ALS has significantly increased (reviewed in ). The recent discovery of hexanucleotide G4C2 repeat expansions in the intronic region of C9orf72 as a common genetic cause of fALS  and frontotemporal dementia (FTD) has profoundly changed our understanding of ALS, explaining almost 40% of the familial cases, in addition to near 10% of sporadic ALS (sALS) [5, 6]. ALS is now considered to be part of a spectrum of neurological disorders instead of simply a neuromuscular disease. Understanding shared pathophysiological mechanisms of sALS and fALS promises the finding of effective therapies for both forms of the disease. Defective cellular processes identified thus far to be responsible for the ALS and the related FTD include (i) alterations to proteostasis control (protein quality control, including proteasomal degradation, autophagy and endoplasmic reticulum (ER) stress), (ii) mitochondrial dysfunction, (iii) cytoskeletal dynamics and axonal transport, (iv) RNA homeostasis, and (v) DNA damage response (reviewed in [3, 7, 8]). Macroautophagy, here referred to as autophagy, is an evolutionarily conserved process that consists of vesicles termed autophagosomes to deliver intracellular cargo to the lysosome, including long-lived cytosolic proteins, damaged organelles, and protein aggregates [9, 10]. Most cell types, including neurons, operate under constitutive autophagy , which is thought to have a vital role in maintaining their metabolic and proteostatic balance [12, 13, 14]. 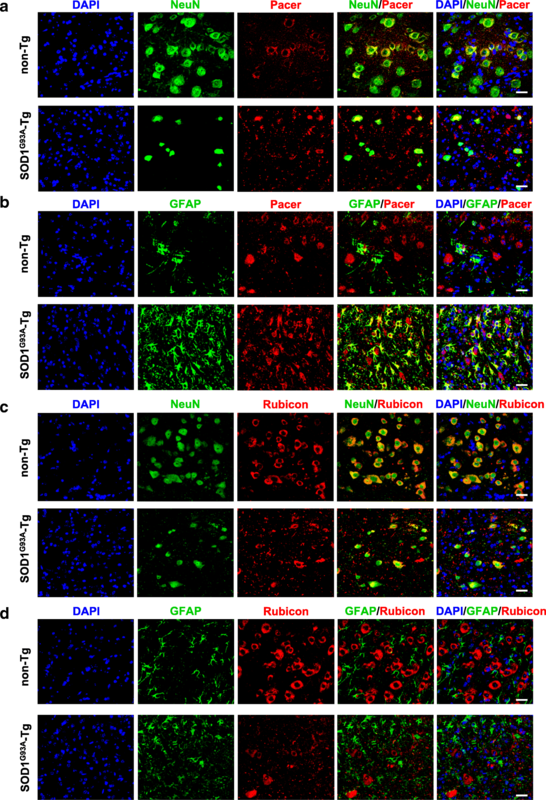 In this context, defects in the endolysosomal pathway or autophagy-related genes have been associated with diverse neurodegenerative diseases, including Alzheimer’s disease (AD), Huntington’s disease (HD), Parkinson’s disease (PD), as well as ALS [15, 16]. Mutations in several genes coding for proteins involved in autophagy or other membrane trafficking pathways have been found in ALS patients, including SQSTM1 and OPTN, which encode the selective autophagy receptors SQSTM1/p62 and optineurin, respectively, and ALS2 that encodes alsin2, which participates in membrane trafficking, as well as TBK1 (TANK-binding kinase 1), a kinase involved in autophagy-mediated degradation of ubiquitinated cargos [17, 18, 19]. C9orf72 was also shown to participate in the autophagy process . Targeting autophagy with genetic and pharmacological approaches has indicated that the pathway may have pathogenic or protective roles depending on the disease stage and cell type analyzed [21, 22, 23]. Thus, defects in autophagy and endolysosomal pathways may underlay an important part of the etiology of the disease. The rise of high-throughput experimental approaches such as genomics, transcriptomics, and proteomics provides new datasets for ALS and other neurodegenerative diseases. Recent comprehensive studies proofed that network-based analysis offers the means to unravel new genes, pathways and disease networks associated with complex disorders similar to ALS [24, 25, 26, 27, 28, 29]. The convergent analysis approach, which is loosely defined as the combination of multi-dimensional datasets with network modeling of gene and protein interactions, provides a new way to identify genes involved in disease pathways or mechanisms even with little or no previous evidence [26, 27]. We applied this approach to the data available for ALS and selected the C13orf18 gene for further experimental studies, based on (i) its suggested participation in the human autophagy network through interaction with Beclin1, one of the main components of this pathway  that is known to be dysregulated in ALS , (ii) a single-nucleotide polymorphism (SNP) in the 3’UTR of the C13orf18 gene (polymorphism ID: rs2478046) found in a higher allele frequency in a sALS patient cohort , and (iii) the fact that the C13orf18 protein was uncharacterized and had no cellular function assigned to it. Due to its sequence homology with Rubicon (Run domain protein Beclin1 interacting and cysteine-rich domain or KIAA0226), C13orf18 is also referred to as Rubicon-like or KIAA0226-L. However, recently, Cheng et al. reported that C13orf18 positively regulates autophagosome maturation by complex association with UVRAG and stimulation of Vps34 kinase activity, hence it was named Pacer (protein associated with UVRAG as autophagy enhancer) . Copy number variation (CNV) data were collected from 4 published studies [33, 34, 35, 36]. A total of 338 genes associated with ALS were included in the analysis. Additionally, genes linked to ALS were collected from The Huge Navigator (an integrated knowledge base of human genome epidemiology). We specifically searched the Phenopedia page for ALS related association studies and reported genes. Using the exact match of term “ALS” or “motoneuron disease,” we retrieved 143 genes annotated in the HuGE database (2011). From those, 128 genes were finally included in the analysis (14 genes were excluded from the analysis because there were not associated with the disease upon revision) (Additional file 1: Table S1). We uploaded the selected CNV and HuGE genes into the Ingenuity Pathway Analysis (IPA) system (Qiagen), which contains protein/protein interaction (PPI) and expression datasets. We ran a “core analysis” approach and obtained 241 genes in 12 ALS-associated subnetworks (Additional file 2: Table S2). We used a convergent network analysis approach based on  to integrate ALS specific high-throughput data, such as HUGE phenopedia and copy number variation (CNV) data (Additional file 1: Table S1) [33, 34, 35, 36], with the global protein-protein interaction network. This approach allowed us to build interaction networks with all ALS associated genes, thus uncovering new connections to previously unrecognized genes/proteins as being part of the ALS disease network (Fig. 1a; Additional file 3: Figure S1 and Additional file 2: Table S2). An evidence-based output of 241 genes/proteins organized in 12 ALS-specific subnetworks was obtained (Additional file 3: Figure S1 and Additional file 2: Table S2). We selected Pacer (C13orf18) for further experimental studies, mainly because it was displayed as a component of a subnetwork composed of itself and Beclin1 (Fig. 1a and Additional file 3: Figure S1h), an interaction previously reported in a proteomic study . 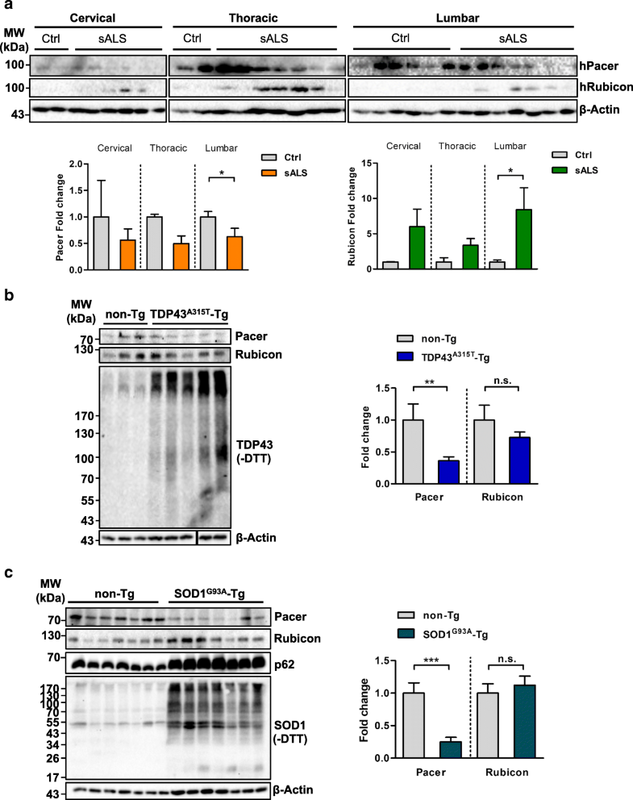 Beclin1 is a well-characterized core subunit of distinct phosphatidylinositol 3 kinase (PI3K) complexes, which mediate multiple steps during the autophagy process. A role for Beclin1 had been implicated in ALS pathology since its levels were found to be increased in the spinal cord from ALS mouse models, as well as in postmortem sALS spinal cord samples [22, 45, 46]. 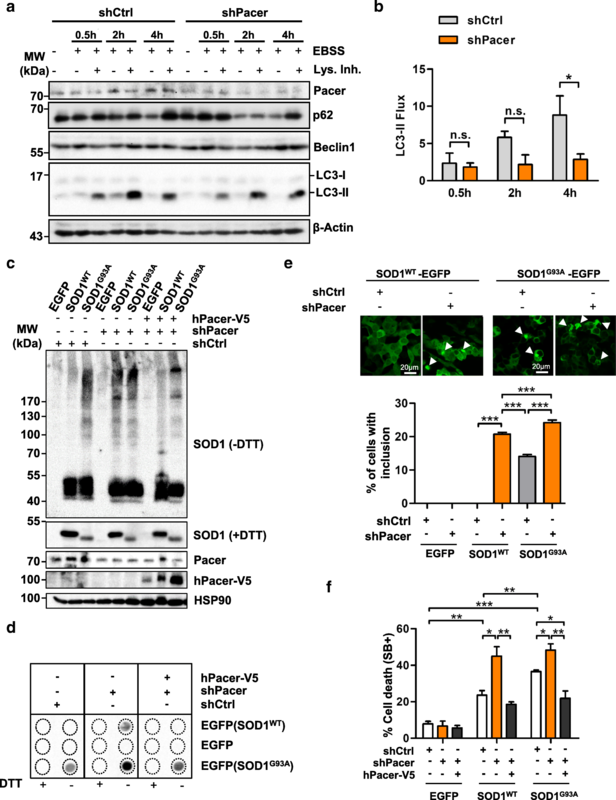 Through its interaction with Beclin1, Pacer was suggested to functionally connect to the autophagy process , which recently was further confirmed by two studies that reported the interaction of Pacer with several components of the Beclin1 complex, including Beclin1, UVRAG, PI3KR4 and PI3KC3 [32, 47]. Hence, we hypothesized that Pacer could play a regulatory role in the autophagy pathway through interaction with Beclin1 and affect ALS pathology through this pathway. Furthermore, an SNP discovered in the 3’UTR of Pacer in a cohort of ALS patients suggests that it could be a modifier of disease . To determine the consequences of reduced Pacer levels in the ALS pathogenesis which we observed in vivo (Fig. 2), we assessed the impact of its repression on mutant SOD1 aggregation and neuronal cell death. Knocking down Pacer in NSC34 cells led to increased mutant SOD1 disulfide-dependent aggregation (Fig. 4c). Interestingly, we also observed the spontaneous aggregation of wild-type SOD1 upon loss of Pacer (Fig. 4c), a phenomenon described in sALS cases [52, 53, 54]. Similar results were obtained by determining the levels of Nonidet P-40 (NP-40) detergent-insoluble protein aggregates (Additional file 9: Figure S6c), as well as by filter trap, an assay that detects protein aggregates by size using a cellulose acetate filter membrane with 200 nm pores (Fig. 4d). Since our shRNA constructs target mouse Pacer exclusively, we restored Pacer levels by exogenous expression of human Pacer (hPacer-V5) (Additional file 9: Figure S6d and S6e). The re-expression of hPacer-V5 restored SOD1 aggregation levels to a similar extent to those observed in control cells (Fig. 4c, d and Additional file 9: Figure S6c). Furthermore, confocal microscopy of SOD1 confirmed these findings. Depletion of Pacer in NSC34 cells led to an increased number of inclusions formed by SOD1G93A (Fig. 4e and Additional file 10: Figure S7), whereas it had dramatic effects on SOD1WT, which built large de novo inclusions similar in size to aggregates observed for mutant SOD1 (Fig. 4e and Additional file 10: Fig. S7). No effect of Pacer depletion on EGFP alone was observed (Fig. 4e and Additional file 10: Figure S7). Since impaired autophagy and increased protein aggregation are correlated with neuronal death, we investigated the effect of knocking down Pacer in NSC34 cells expressing wild-type or mutant SOD1. We found that the depletion of Pacer sensitizes cells to SOD1WT or SOD1G93A toxicity, whereas cells expressing EGFP alone are unaffected (Fig. 4f and Additional file 10: Figure S7a and S7b). In comparison, the depletion of Rubicon did not result in cell death in NSC34 cells expressing mutant SOD1 (Additional file 10: Figure S7c and S7d). Furthermore, the reconstitution with hPacer-V5 rescued the survival of cells expressing SOD1WT or SOD1G93A (Fig. 4f). Human Pacer expression even improved the survival rate when compared to cells expressing scrambled shRNA construct (shCtrl cells) in the presence of SOD1G93A (Fig. 4f). 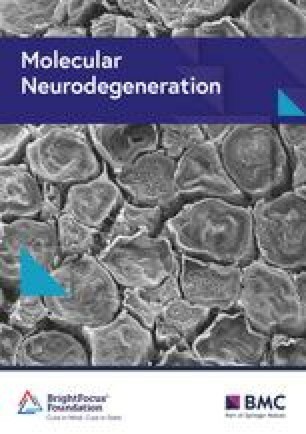 Taken together these results indicate an important role for Pacer in maintaining proteostasis in motoneurons by promoting SOD1 aggregate removal and sustaining motoneuron survival. Neurodegenerative diseases, such as AD, PD, and ALS, are multifactorial, involving a combination of genetic and environmental factors, as well as age as the primary risk factor. Genetic studies in ALS have made significant advances in the understanding of disease pathogenesis by using whole genome or whole exome sequencing strategies (reviewed in ). However, the primary cause of approximately half of fALS cases and the majority of sALS cases remains unexplained. The use of systems biology approaches to study neurodevelopmental and neurodegenerative diseases has recently proven to aid our understanding of underlying disease mechanisms by unraveling new genes, pathways or subnetworks responsible for an illness which would not have been recognized using traditional approaches. Here we describe Pacer, a protein previously proposed as a tumor suppressor and cancer biomarker [55, 56, 57] and recently reported to be associated with autophagy , as being immersed in the ALS disease network. We performed a convergent analysis by merging all ALS data available to uncover pathways and associated new genes involved in the disease. By retrieving and integrating data from different model systems and patient studies, experimental bias was filtered out, and only relevant mechanisms may be uncovered. From the list of genes obtained through this analysis, we selected the protein Pacer, previously known as C13orf18, based on its putative role in autophagy, a compromised pathway during ALS pathogenesis. At the time, the only data available for Pacer was based on a proteomic study of the autophagy network, which suggested a role in the autophagy pathway via interaction with Beclin1 . Furthermore, a connection to ALS was suggested by the identification of an SNP in the 3’UTR of the Pacer gene in a cohort of sALS patients . The specific consequence of the SNP in the 3’UTR of the Pacer gene in ALS pathogenesis, however, need to be more explored in future studies. The likely presence of variants in the UTR or intronic regions of ALS genes has been exemplified by the most common genetic modification known to cause ALS, C9orf72 intronic repetitions . Furthermore, variants in untranslated regions of well-known ALS-causing genes, including SOD1, TARDBP, FUS and UBQLN2, have been recently reported . Although these variants do affect the amino acid sequence of the affected the protein, they can have important effects on other aspects, such as expression level. For instance, Al-Chalabi and co-workers showed that variants in the 3’UTR of the FUS gene found in Italian ALS patients promote mislocalization of the FUS protein and result in a dramatically increased expression of this protein [60, 61]. Similarly, variants found in the 3’UTR of the TARDBP gene also regulate its expression by affecting the RNA stability of its transcripts . Here, we found Pacer levels to be decreased in sALS patients, similarly to two fALS mouse models, hence Pacer may participate in a transversal mechanism to protect neurons against disease. To study the role of Pacer during ALS pathogenesis, we used the mouse motoneuron-like cell line NSC34. We demonstrated that Pacer expression is up-regulated on the transcriptional and translational level upon autophagy induction, resembling the behavior of other autophagy genes [65, 66]. Furthermore, we confirmed the interaction between Pacer and Beclin1. Comparable results were obtained by Cheng et al. in U2OS cells recently . 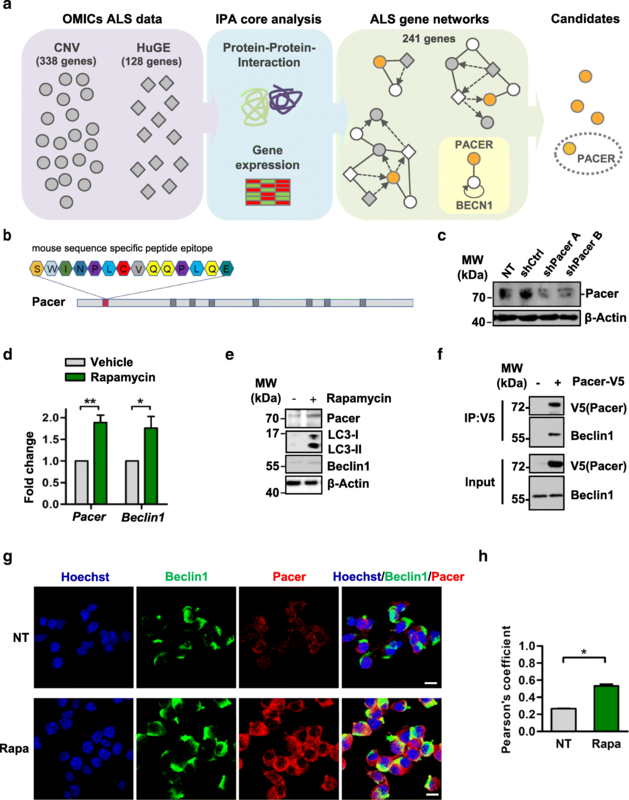 Pacer shares highest sequence homology with Rubicon, which has become, in recent years, known as an important regulatory protein of autophagy and endocytosis, as well as of LC3-associated phagocytosis [67, 68, 69, 70, 71]. Pacer and Rubicon are part of the same protein family due to their shared Rubicon homology (RH) domain. Interestingly, they were reported to perform opposing functions in the autophagy pathway, Rubicon as a negative regulator of the UVRAG-Beclin1-Vsp34 and UVRAG-HOPS complexes through its binding to UVRAG, while Pacer antagonizes Rubicon by competing for UVRAG binding, hence positively influencing autophagy activity . In concordance with these results obtained in HEK293T cells , we also find that motoneurons depleted of Pacer are impaired in their autophagy flux.